olla old church was dedicated to Saint Mary on 28th October. In which year is still unknown. The church is built in Holla forest with an excellent view over the town and lake. he church can be seen from parts of Eidsbygda, from Ulefoss, Romnes and parts of Sannes, as well as from Valebø on the other side of the lake. However, the best place to see the church from is from within the parish itself. The building was probably built in the early part of the 1200s, possibly on an earlier site of non-Christian worship. rientation is the usual East-West. The church is built in `gneiss' stone, quarried locally, with mortar joints. Our forefathers had great expertise with mortar. he nave of the church is 50 feet long by 28 feet wide externally, and the walls are 3' 6” thick.The chancel is 14 feet long by 17 feet wide. 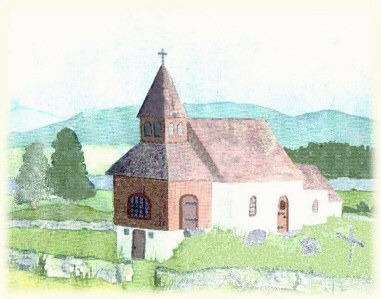 In front of the church was a large wooden porch with stone foundations, approximately the same size as the chancel. Above this was a small square bell tower with a pyramidal roof. The ruins show that the original church must have been tiny - about half as long as it is now. n the eighteenth-century the little church was on the brink of collapse. The then priest Stabel reports that the chancel had fallen down. However, a local man called Halvor Sørensen Borse left 800 rd in his will for the development of the church generally and the rebuilding of the chancel. This work was carried out, and at that point the church must have looked like the above picture. The priest and people were more than satisfied with the result and Borse's name was held in high regard long after his death. t this time the old entrance door on the south side of the building was bricked-up and the new west porch was erected. or about 800 years the people of Ulefoss had come to the church for prayer and baptism, wedding and funeral, they had come with their sins, their joys and their grief. The building for them was exalted and holy - and even today the ruins are fascinating for us. There we find ourselves in a silent service. The peace of the graves comes over us and the ruins remind us that we all perish in the end.